Mikalojus Konstantinas Ciurlionis was born in 1875 in the southern Lithuanian town of Varena, near Vilnius. Doubly talented, he was an artistcomposer who could hear colours and see sounds and whose life was comprised of the close interaction between musical and artistic composition. In his homeland of Lithuania, Ciurlionis was celebrated as an exponent of musical modernism and the founder of a national school of music. Yet he was without doubt an avantgarde artist of European standing, an artistic visionary between the late Romantic and Modern ages, one of a number of creative innovators of the early 20th century, among them Skryrabin, Schönberg and Ravel, all born in the same year. Trained in Warsaw and Leipzig, he worked as a composer and painter in Warsaw, Vilnius and St. Petersburg. In the mere fifteen years prior to his untimely death in a Polish sanatorium in 1911, he produced an immense number of artistic and musical works including 200 paintings, 80 drawings and more than 270 musical compositions, about 170 of which were scored for solo piano. This recording presents both his early and late piano compositions. His early works are finelyspun webs, often tinted with melancholy, many less than a minute long, moments immortalised like thoughts noted down in a diary. The later pieces, on the other hand, such as the piano cycle Marios or the Six Preludes Op. 33 evoke their own special tonal world through the use of unusual, disturbing melodies. 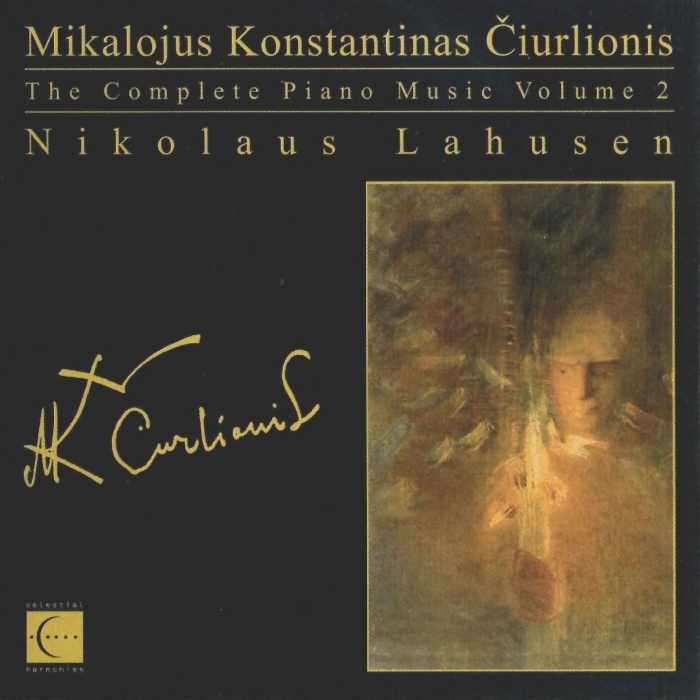 Recorded at Bavaria Studios, München, as a coproduction between Celestial Harmonies and Bayerischer Rundfunk, this is volume two of the firstever recording of the complete piano music of Mikalojus Konstantinas Ciurlionis, performed by Nikolaus Lahusen. Lahusen was born in Bremen, Germany, in 1960 and grew up in Mexico. His artistic development was supported by Edith Picht-Axenfeld, Christoph Eschenbach and Bruno Leonardo Gelber. Counted among the leading pianists of his generation, Lahusen has given concerts worldwide. International radio and television stations have broadcast his concerts and recordings; his numerous recordings have been well received among music critics. 1 Präludium d-moll VL 106 (op.1) 0'45"
2 Mazurka F-Dur VL 143 2'59"
3 Walzer b-moll VL 144 2'33"
4 Kleine Polka F-Dur VL 145 1'16"
5 Mazurka f-moll KJZ 566 1'10"
6 Polonaise b-moll VL 190 2'32"
7 Präludium c-moll VL 189 3'01"
8 Mazurka es-moll VL 161 0'46"
9 Mazurka C-Dur KJZ 579 0'58"
10 Walzer F-Dur VL 177 2'18"
12 Mazurka Des-Dur VL 180a 2'19"
13 Präludium F-Dur VL 109 0'41"
14 Walzer B-Dur VL 159 3'34"
15 Mazurka C-Dur VL 237 1'43"
16 Mazurka fis-moll KJZ 773 0'33"
17 Mazurka fis-moll KJZ 573 1'26"
18 Litauisches Lied h-moll VL 146 0'38"
19 Melodie D-Dur KJZ 738 0'53"
20 Melodie E-Dur KJZ 760 0'32"
21 Mazurka cis-moll VL 200 1'53"
22 Mazurka e-moll VL 198 0'26"
23 Mazurka H-Dur o.O. 2'36"
24 Mazurka e-moll VL 236 1'52"
25 Mazurka h-moll VL 167 1'04"
26 Mazurka es-moll VL 197 (op.8,1) 2'01"
27 Präludium f-moll VL 222 (op.8,2) 3'39"
28 Präludium d-moll VL 239 (op.12,1) 1'44"
29 Postludium C-Dur VL 240 (op.12,2) 1'49"
30 Präludium h-moll VL 333 (op.12,3) 1'24"
31 Moderato VL 317 (op.28,1) 3'01"
32 Andante VL 318 (op.28,2) 3'21"
33 Allegro impetuoso VL 319 (op.28,3) 1'05"
34 Präludium VL 338 (op.33,1) 2'43"
35 Präludium VL 339 (op.33,2) 1'37"
36 Präludium VL 340 (op.33,3) 1'08"
37 Präludium VL 342 (op.33,4) 0'47"
38 Präludium VL 343 (op.33,5) 1'08"
39 Präludium VL 344 (op.33,6) 1'04"
40 Fuge VL 345 (op.34) 5'50"